This Easter, the Easter Bunny and friends will be making a special visit to Jubilee Market, in the heart of Covent Garden, on Good Friday and Easter Sunday for the market’s egg hunt egg-stravaganza. Between 12 and 4pm on the 25th and 27th March, little ones will have the chance to hunt through the colourful and lively market stalls to find an array of hidden eggs. Successful hunters can then trade in their finds to the Easter Bunny, in exchange for a bag of treats. With eggs carefully hidden at each of the unique stalls, there’s plenty of edible prizes to go around. 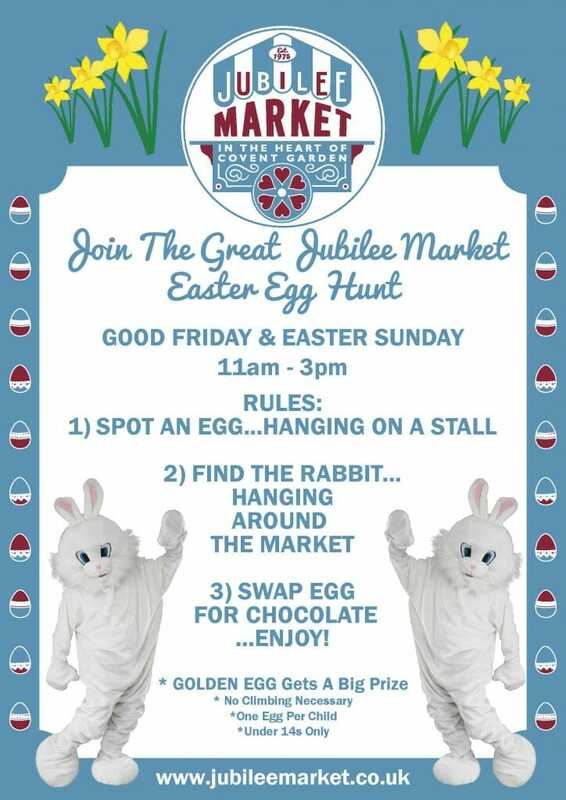 Free to enter, the Jubilee Market Egg Hunt welcomes all visitors to take part on either Friday’s general merchandise market or Sunday’s arts and crafts market. In addition to the Easter goodies, guests can also peruse the aisles of special gifts, eclectic buys, vintage and street fashion and fun souvenirs.